Grateful for God’s Grace in 2017. Trusting the Sovereign -Shepherd for the Journey in 2018! And in all, thankful for you–my fellow sojourners with Christ and recipients of Abba’s love and mercy! Indeed He is our Sovereign Shepherd. Yes, indeed! God bless you greatly, David! And you as well, David! Your blog has been such a blessing to me this year. I pray God continues to bless your ministry in extraordinary ways! Yes! Here’s to the next part of all our journeys! Thank you so much for your kindness, Vincent! You have honored me greatly and I can’t say thank you enough! Happy New Year, my friend! I’m so sorry to hear that Anne is battling metastatic cancer. My mother died of cancer and I battled it as well. I will keep her in my prayers, Ian! Oh, Ian… I am so sorry. That is such a tough situation. I know your heart must be breaking. I will pray as soon as I post this reply. And thank you for your thoughtful question. Yes, I was very fortunate to have the live and support of my husband, son and mom during my journey. Mom was diagnosed a few weeks after I finished chemo. Tough days, but somehow, with God’s help, I got through it all. I will pray the same for you all! Let me know if I can pray for any specifics along the way. My heart is with each of you on this difficult journey. You got it, Ian. Prayer is something that I’m passionate about… God has frequently given me a ministry of prayer and thus, you can be sure that I will pray for Anne. My heart breaks for all of you. Let me know what I can do to encourage you along the way…I’m here (albeit, across the big pond, and therefore, limited to serving as a listening ear and a praying heart). Nevertheless, I’ll walk with you all through this in spirit. May God surround you with His peace, comfort and care as you walk this path! This is an amazing painting. You and Paul should meet somewhere in the middle and talk art someday. You both have so much talent. Aww… thank you with all my heart, dearest Kathy!! Your encouragement is always particularly meaningful to me since I know that you truly know and understand art and the artist’s journey. Paul is so extraordinary! Wouldn’t it be wonderful if my husband and I could meet up with you two someday?! I can always hope. 🙂 And in the meantime, I’m thankful that we can communicate and stay in touch through our blogs! ❤ and hugs! The internet has opened many new friendships. I extremely grateful for yours. Thank you so much, dear Maggie! I’m so glad that 2018 will mean doing this blog journey with you! I’m grateful to have met you here, and can’t wait to see all that God will do through you in 2018! Hugs! You’re welcome, and thank you soo much! 🙂 ❤ Hugs to you, too! God bless you greatly, Carlos!! Lynn, Thank you! I appreciate the scripture – so appropriate for beginning the New Year. Amen! God is so good! He knows what we need. And, he supplies. He works in us and through us for his glory, and so that we can be an encouragement to one another. Praise His Holy Name! Amen, dear Sue!! Thank you, Abba! ❤ and hugs! Huge Hugs to you Heather! Amen! Lynn. I hope younhad a great New Years and I agree with what Philippians had to say. We need to forget what is behind us and focus on what is in front of us. We as Christians need to press forward with God and to win the prize that God has called us to have. Happiest of New Years Lynn—I consider it quite the gift having become friends!!! Ahh Lynn—that is disappointing as I know how excited you were–but postpone will just mean at a different time–and maybe a time when, as perhaps God knows best, that you will benefit even more so…. Yeah… I’m okay with it. The fine art studio that was hosting it hopes to reschedule it for sometime in the Fall. So, hopefully that will work out. I’ve got so much on my plate right now that after getting over the initial disappointment, I’m okay with it. Oh, goodness… didn’t know that you were experiencing the same cold as we are here in Northern VA. That’s horrendous for you all. I’m afraid it is going to be a looooong winter this year. Sigh. Stay inside and drink lots of hot chocolate 😉 Hugs! Short and sweet lynn. Nice. 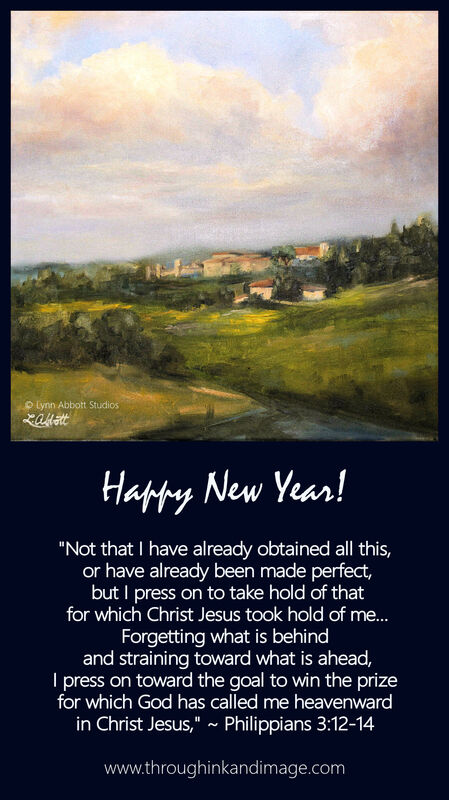 Great verses for the new year and an awesome painting to go with it! I press on to grab a hold of Jesus because He has a firm grip on me! Yes!! I’m doing the same, Martha! And thank you for your kind, thoughtful and encouraging words! God bless you big time! Happy New Year, Lynn! May God bless you and keep you close to His heart this coming year! Oh, thank you! You are so good to me! I am so very honored that you have mentioned my painting in your post. You are a truly thoughtful friend! Hugs! Once again dear Lynn, it gives me pleasure to wish you much Love, Joy, Peace and Hope in this New Year and of course the Rest that only comes from The Lord. I look forward to our Sharing together on our Blogs and always feel free to e-mail me if wanted. I noticed Lynn in one of your Comments to Ian that you have had Cancer, I’m so Thankful your OK now, God is so good. I had suspected Breast Cancer although it had disappeared by the time I had the Tests which were not long after my Doctor had confirmed it and said it was very advanced. I have had other Life threatening Conditions disappear too but God has used Doctors, Medicine and Natural Remedies to Heal me also, they are all His Tools but He is the only Healer, all good things come from Him and being Healed is very good.